Today we’ll examine two Windows 10 software products that can export email from your Microsoft Outlook .pst file and turn them into pdf files. Microsoft Outlook remains the most widely used desktop email client in the world. For all of Outlook’s great capabilities, it’s not very useful for exporting email and converting it to a different format. For example, in Outlook 2010, the native export capabilities are limited to saving email to a text file, an Outlook template, or a single Outlook .msg, html or mht file. While it is possible to export a small quantity of selected emails to text format, this quickly becomes a tedious chore. You can export a large quantity of emails to MSG format by selecting them in the mail list, then dragging them out of the Outlook mail list and dropping them into a Windows folder. Yet exporting from Outlook to other formats are limited to a single file, and no control is provided over the naming of the exported files. Two products that can improve your experience with exporting Outlook email are: MessageExport&trad; add-in for Outlook, and PstViewer Pro&trad;. These products are both similar in their functionality, but yet quite different in their approaches. 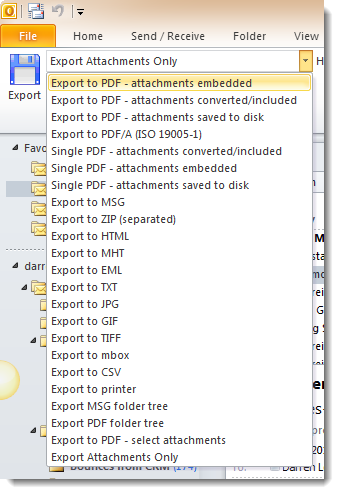 For example, while MessageExport works from inside Outlook, PstViewer Pro works independently of Outlook. The product that is the best choice for you will likely come down to whether you prefer to work inside or outside of Outlook. Free trials are available for either product so you can try both before making a purchase decision. 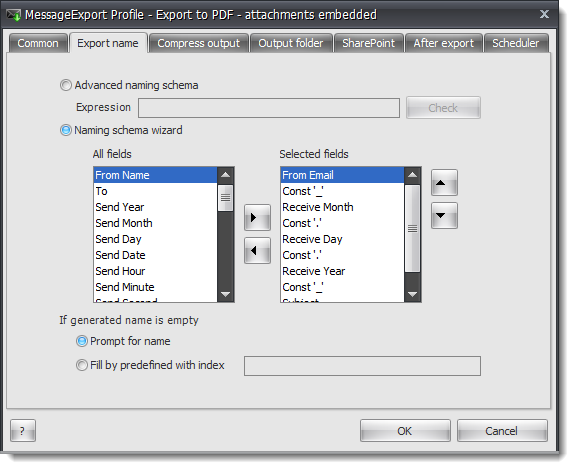 (these are called Export Profiles), and click the Export button. select all messages in your Outlook mail list, just type control-A. 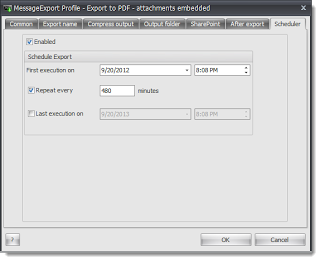 MessageExport is very strong with Outlook to PDF conversion. You can tell MessageExport how it should handle the email file attachments, such as embedding the attachments as separate files within the PDF document, extracting the attachments, or converting them into the PDF image. There is also support for ISO 190005-1, the international standard for email archiving to PDF. 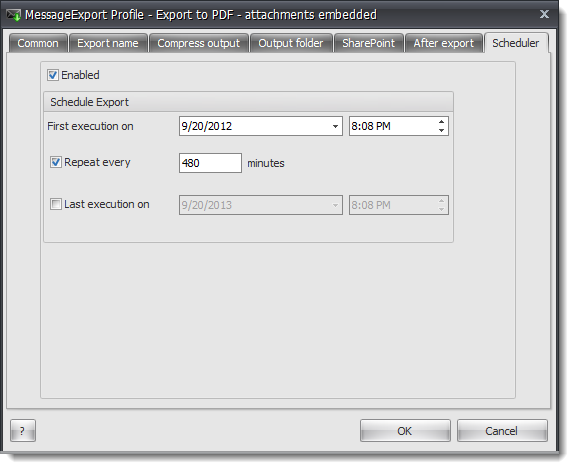 MessageExport includes a scheduling feature. You can use it to run any export profile on a recurring basis. The timer can be set to run based on the number of minutes, such as 5 minutes, 60 minutes, or 600 minutes. MessageExport gives you a lot of control over configuring the Outlook email export operations. All of the selections that you see in the drop down list are customizable in important ways, including the target folder for export, and how the resulting files should be named. While exporting thousands of emails from Outlook, it may be desirable to apply a special naming plan to the resulting files. 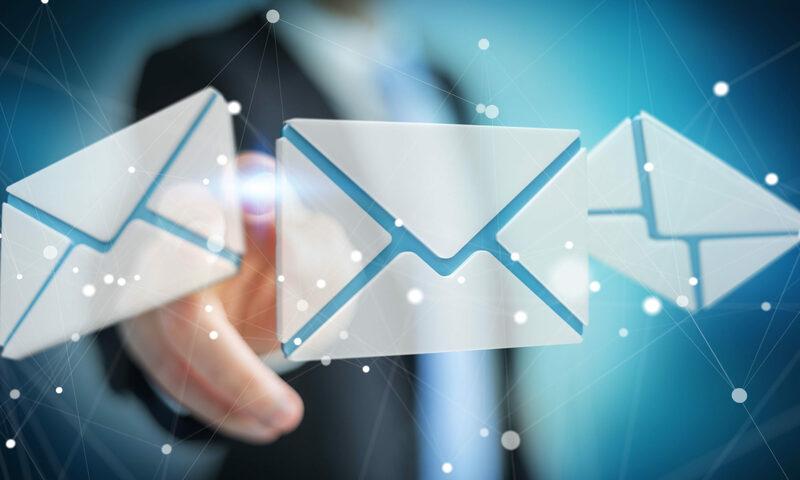 MessageExport has you covered, allowing you to create complex combinations of naming schemes with 28 different pieces of information from the email and connecting characters. For example, you could create a name that includes the sender’s email address, sent date, and time received down the he second. There are virtually limitless combinations. MesageExport is a useful add-in for Microsoft Outlook. If you need to expand Outlook’s ability to export email messages, or if you want to automate email export from Outlook to a particular format, then try MessageExport.